This is a TOP level Resource. These are used to validate/prove that a client is who they say they are. There are different type and levels. The default Authenticator will be anonymous and have a level of 0 (zero). These resources are available at the root/base of the URI and are read-only. Clients can GET the available Authenticators and GET the details about a specific Authenticator. An Authenticator is needed to obtain a Session. This is a TOP level Resource. These are created when a client specifies an Authenticator and provides proper credentials (used by the Authenticator). After the Authenticator "authenticates" the client, a Session is created. The Session's unique identifier is returned to the client. The client will need to include this Session Id with every RESTful request. A client can create (GET) a Session. Clients can not view (GET) a list of Sessions. The client can read (GET) there own session. Clients can also invalidate (DELETE) there own Session. This is a TOP level Resource. These are used to specify the "type" of Subjects that will be managed. The Context uses the configuration file to define the Subject. The Context definition includes the type of back-end Service, Operations, and Attributes. A Context supports only one type of Subject. The client can read (GET) the available Contexts, view (GET) the details for a give Context. The Context is a read-only Resource. This is under the Context Resource. These refer to entries in the back-end Service. The client can List/search (GET) the existing Subjects, Read (GET) an individual Subject, Create (PUT/POST) a new Subject, Update (PUT) an existing Subject, and Delete (DELETE) a single Subject. The Authenticators are defined in the Security section of the configuration file. Each Authenticator defines it's own "level" (0,1,2,3). The Context specifies what minimal Authenticator level it needs. The following information is describing the intended behaviour of the RESTful web service interaction with the RESTful server component for the OpenPTK. The client uses PUT when it is in charge of deciding which URI the new resource should have. The client uses POST when the server is in charge of deciding which URI the new resource should have. OPENPTKSESSIONID This is the name of the HTTP Cookie that is used by the "Server". This could should be created/managed by the ServeletFilter. Its value will be a uniqueId and will be used to store cached data about the user. views A "view" provides an aggregated set of information related to a subject. A view is a READ-ONLY Resource providing a convenient way of returning related information with a single GET request. Relationships apply to Contexts that define a Model. 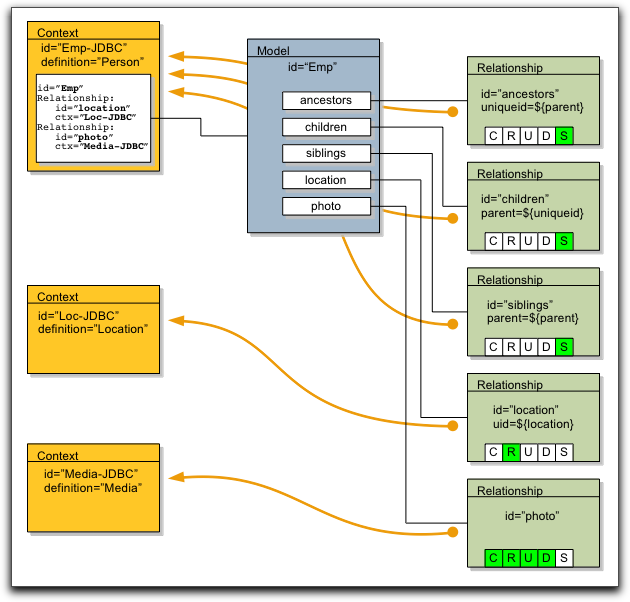 The Model contains a set of Relationships. 204 NO_CONTENT The server successfully processed the request, but is not returning any content. 403 FORBIDDEN The request was a legal request, but the server is refusing to respond to it. Unlike a 401 Unauthorized response, authenticating will make no difference. 404 NOT_FOUND The requested resource could not be found but may be available again in the future. Subsequent requests by the client are permissible. 500 INTERNAL_SERVER_ERROR A generic error message, given when no more specific message is suitable. 503 SERVICE_UNAVAILABLE The server is currently unavailable (because it is overloaded or down for maintenance). Generally, this is a temporary state. The OpenPTK RESTful Client API provides a Java interface to the OpenPTK Server. The API handles all the RESTful communications and provides access to "operation" via Java objects. The API uses an Output object to return results from Operations. The Output will contain a State based on the response from the OpenPTK Server (HTTP/REST Response). The following table outlines the possible State values. 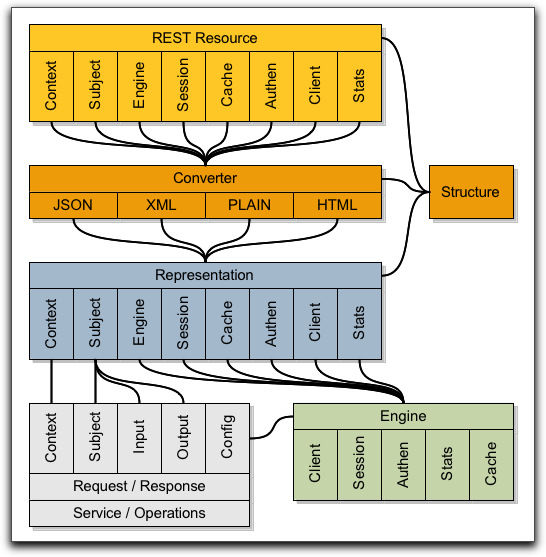 If the HTTP Response provides more information, that data will be placed in the Output status. org.openptk.structure This package and all it's classes define the "Structures". The "Structure" is a data model that is used to define arbitrary related information. Each Structure has a name and a value. It also supports a List of children and a List of peers. These Use Cases define typical scenarios that will leverage the RESTful interface. The default Representation will be used (json). A collection of Subjects will be returned and it will contain URI's to access each individual entry. re-direct client to authenticate. Provide goto Query Parameter so that the Client can "return" to this scenario after they have been authenticated. The OpenPTK Authenticator infrastructure will be extended to meet the RESTful requirements. Each type of data will be exposed as a resource. The client can request part of the search result set by supplying a offset and length with their query. The HTTP query parameter is the recommended approach in order to ensure simplicity for all users of the RESTful service. Returns a collection of Subject Objects (Subjects) in the specified format. Returns a single Subject (Object) in the specified Representation.